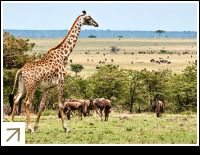 Kenya, with its game-filled plains, rugged mountain ranges and the Great Rift Valley lakes is one of the most exciting safari destinations you'll ever experience. This country is considered the birthplace of the safari making it a magnet for people seeking out the thrill of spotting the Big 5 in the untamed African bush. And everyone has heard of the Masai Mara, famed the world over for the Great Migration. We offer a unique selection of safaris, with accommodation ranging from luxury lodges and stylish bush camps to tented campgrounds and seaside villas, ensuring there is something to suit every traveller. A Kenyan safari is almost a rite of passage into Africa and once you go there you’ll understand why. An extinct volcano sitting on the equator with several distinct biological zones and glaciers. The majority of animals live on the lower slopes of the mountain and there are some excellent trekking opportunities. Every year the Great Migration sees around a million and a half wildebeests and countless zebras and gazelles migrate across the hot plains in search of fresh green shoots. They are pursued relentlessly by the hungry jaws of Africa’s top predators and the scene is set for one of the most dramatic shows on earth. And what better way is there to see it than from the basket of a hot air balloon? Black rhinos, huge herds of elephants, and a stunning mountain backdrop. Amboseli is Kenya’s second most popular safari destination and you can see all of the key animals here, including lions, cheetahs , vast amount of plains game and over 1,000 elephants. Luxuriant jungle, lions and the setting for Born Free. Meru is less popular than some of the other parks but that can mean that you often have the game viewing all to yourself. 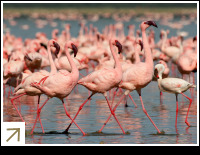 If you have ever wondered what a lake covered with thousands of flamingos looks like, Lake Nakuru is the place to go. In a continent crammed with beauty it is hard to stand out in Africa, but Nakuru does exactly that and it is one of the must-see destinations on any traveller’s Kenya itinerary.